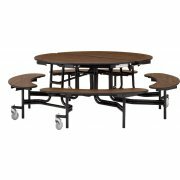 Round cafeteria tables give a large lunchroom a more intimate feel. A unique design balances safety and convenience so you can get the best for your students and your space. A curved frame and well-spaced benches enable students to get in and out without tripping. The torsion bar system allows one person to easily fold and unfold the table. Automatic locking in the fully-open and fully-folded positions ensures secure placements. With all of the tough use required in a school cafeteria, durable lunchroom tables are a must. Low maintenance laminate surfaces, a phenolic backer, a steel frame and tamper-free hardware create a robust table that can handle heavy daily use. 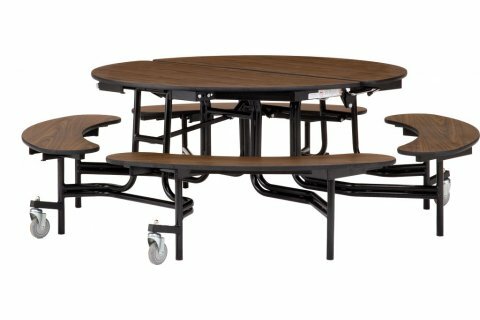 Heavy-duty casters automatically lift off the floor when this cafeteria table is in the fully-open position. 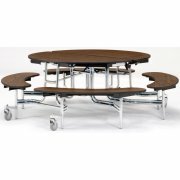 NPS Folding Round Bench Cafeteria Table - 60” dia. NPS Folding Round Bench Cafeteria Table – Plywood, 60” dia. Round Bench Cafeteria Table–Plywood, ProtectEdge, 60” dia.